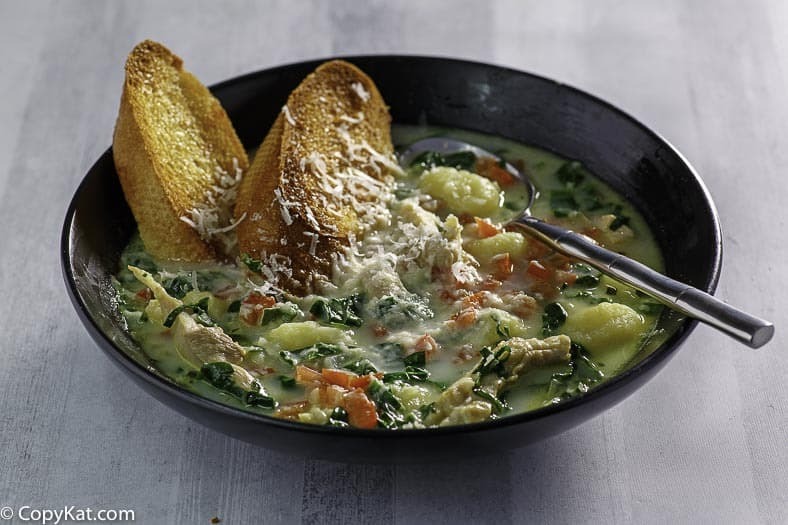 Macaroni Grill Chicken Toscani Soup is creamy chicken soup, packed with fresh herbs and vegetables, along with gnocchi. 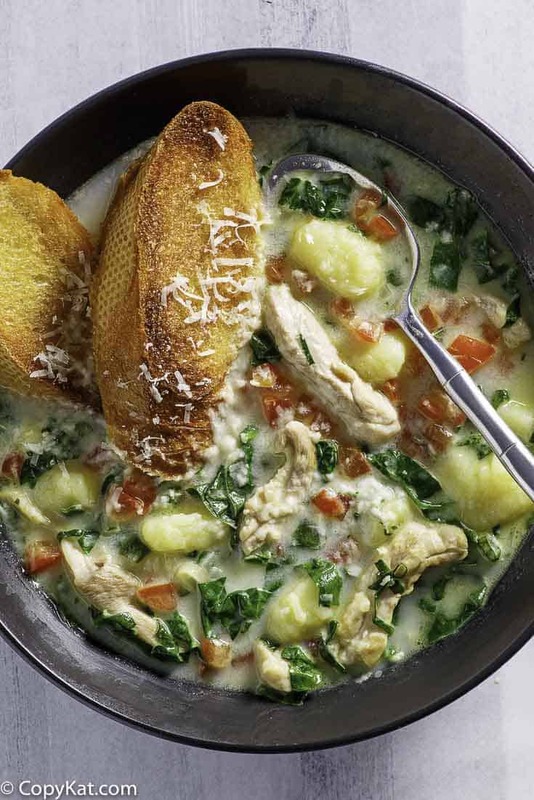 If you like the Olive Garden Chicken Gnocchi soup, you will enjoy this soup as well. Although no longer on its menu, Macaroni Grill’s Chicken Toscani Soup was one of its most popular soups of all time. Indeed, even other restaurant chains have tried to copy the recipe! The tasty soup is made with broth, vegetables, herbs, cream, and gnocchi. Gnocchi, a small, Italian, semolina dumpling, are often served as a replacement for pasta, but they can be fried like potatoes and served as a side dish. In Italy, gnocchi takes on different flavors reflecting the tastes of the country’s different regions. And until recently, gnocchi was only available from Italian specialty stores in America. But the mainstreaming of Italian cuisine as brought good, quality, ready-made gnocchi to almost every Main Street grocery store. Macaroni Grill first imported their gnocchi from Italy and then began making their own. Phil Romano opened the first Macaroni Grill in Leon Springs, Texas in 1988. Since then, Macaroni Grill as grown into an international franchise with locations in places like Japan, Germany and Mexico. Romano doesn’t own the franchise anymore. Today, he runs Hunger Busters, a non-profit organization that provides dinners to needy school children in the Dallas, Texas area. If you miss Macaroni Grill’s Chicken Toscana Soup, look no further to satisfy your craving. For the most authentic taste, buy the freshest ingredients when shopping for this recipe. 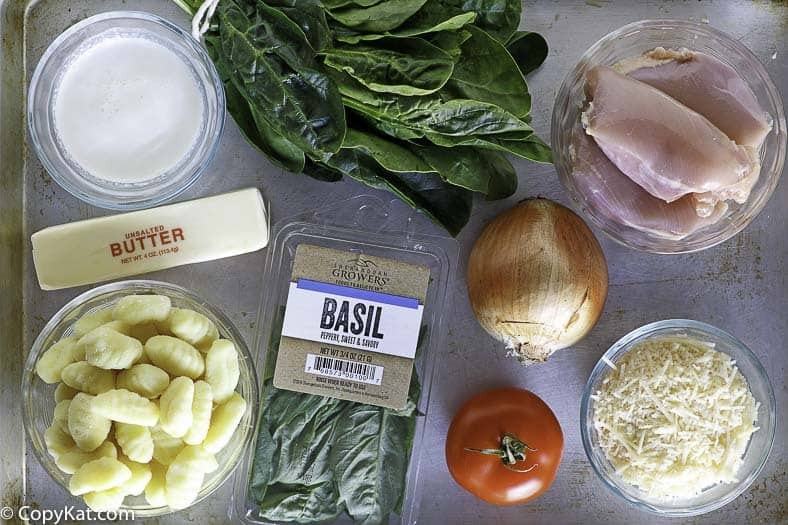 Although homemade soup notoriously starts with leftovers, Macaroni Grill’s Chicken Toscana Soup was always made with fresh herbs and vegetables. If you have your own broth, measure out 3 ½ to 4 cups to replace the canned broth. It also might be fun to use miniature gnocchi, if you can find them. You can make the Macaroni Grill Chicken Toscani Soup with this copycat recipe. In large stockpot place extra virgin olive oil, then add onion and chicken, and sauté. Once cooked through, add garlic and stir through. Add butter and flour, stirring until combined and lightly brown. Stir in two cans of chicken broth, making sure you scrape the browned bottom of the pan to let in the entire flavor. Add gnocchi and parsley and let simmer for a few minutes to cook gnocchi through. Add half and half, spinach, and fresh basil. Perfect for fall. This soup tastes better the 2nd day. This is one Yummy soup! I used store bought roasted chicken. Quick and easy! A friend made this and it is YUMMY!!! Macaroni Grill has taken the Chicken Florentine Salad off the menu. It had grilled chicken, spinach, orzo, and I can’t remember what else? Does anyone out there remember?